Fate: maist probably taken apairt bi Rotherhithe shipbreaker c.1624. Lenth: c. 80 - 90 ft. on deck, 100 - 110 ft. oweraw. 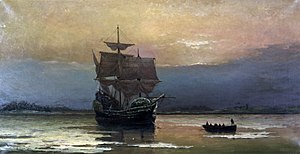 The Mayflower wis the Pilgrim ship that in 1620 made the historic voyage frae England tae the New Warld. The ship carried 102 passengers in twa core groups – releegious Separatists comin frae Holland an a lairgely non-releegious settler group frae Lunnon. This page wis last eeditit on 23 Februar 2018, at 20:15.